I know TA isnt always well liked in r/ethrader but here is my bull case for eth. ETH is currently sat in the middle of a large symmetrical triangle (much like Bitcoin). 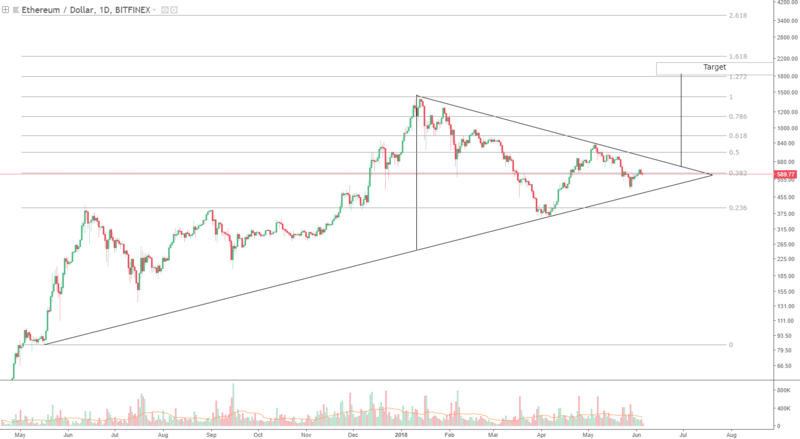 While a symmetrical triangle can break in either direction my argument is for a breakout upwards. The target for this pattern is the height of the pattern which is top of $1430 – bottom of $250 that gives us a $1180 target from breakout. That gives an estimated target zone of ~$1900. I have placed a Fib set running from the start of my bottom trend line at $84 to ATH at $1430. Using the fib extensions we get the 1.272 and the 1.618 (this one being one of the more reliable fib extensions) sat either side of the target zone. Assuming we break the 1.272 fib line i would certainly expect a test of the 1.618 line. Even if this is a short term blow off top.